The Archbishops of both Canterbury and York, the Most Reverends Justin Welby and John Sentamu, will be joining those attending this year’s Spring Harvest. 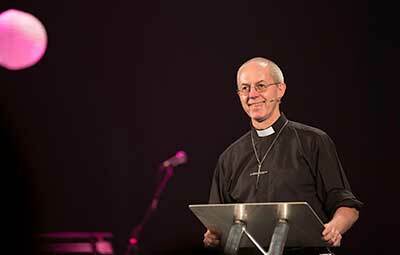 The Archbishop of Canterbury, Justin Welby will be at the Butlins resort in Minehead on Palm Sunday 9 April and the Archbishop of York, John Sentamu will be in Skegness on Tuesday 11 April. The title of Spring Harvest this year is One for All and the theme of the event is ‘Unity’. Both Archbishops are known for their concern on this issue, with Justin Welby in particular popularising the concept of ‘good disagreement’ – how to disagree without being disagreeable; being gracious without compromising. Malcolm Duncan, who has written the material accompanying the unity focus of the 2017 event, said “It is a vital question for us to consider at this time. It is a much bigger issue than just how congregations and denominations relate to one another. God does not want us to build fences and to hide ourselves away from one another. He wants us to be one. There is enough suspicion and criticism outside of the Church without us bringing it inside as well. Those attending Spring Harvest this year will be challenged to consider, amongst other things, how to disagree well, what Biblical unity across denominations and networks could look like, and what it means to stand with persecuted Christian brothers and sisters across the world. The unity theme will be going beyond Spring Harvest to most of the UK’s other major Christian festivals and events as part of a wider commitment by Christians to declare that they are united by far more than the issues that divide. Entitled ’17:21’ and based on the words of Jesus’ prayer in John 17:21, the initiative will see hundreds of thousands of Christians across a number of festival declare their joint allegiance to Christ. Malcolm Duncan, commenting on the plans said, “Spring Harvesters and hundreds of thousands of other Christians across this year will join together in a shared and united commitment: to declare that we are one in Christ, one in the gospel and one for the sake of the world. I am excited at what God will do with and through Spring Harvest this year and look forward to it with real anticipation.